CFL Bulbs Can Make Your Beauty Go POP! Have you every wanted that natural glow or perfect day time lighting while streaming live on cam? Perhaps you’re unsure of how to get the proper effect with your own setup and aren’t quite ready to purchase a high end light kit and figure it out. The truth is it’s not always necessary to spend a large amount of money on soft boxes and umbrellas to achieve a look utilized by major production companies for your cammodel stream. In many cases you can elevate a mediocre stream and save money by using specific daylight bulbs and/or back drops in compatible colors. One of my favorite gadgets that I absolutely love for enhancing my image online and creating the perfect glow is my diva ringlight. It’s perfect for centralized lighting and creates a soft spotlight around the focal point of any stream which will be you the cammodel. This sort of lighting system I’ve noticed is very popular among YouTubers and makeup artist. But after noticing how glorious and complimentary the effects were I decided to try it out while live streaming. I found myself looking amazing even in low light situations and Because ringlights typically do not give off light in a large radius, I would recommend using additional lights off to the sides to make to enhance your lighting. If you don’t want to purchase a ring light there are several Youtube videos showing how a person can make one basic supplies. 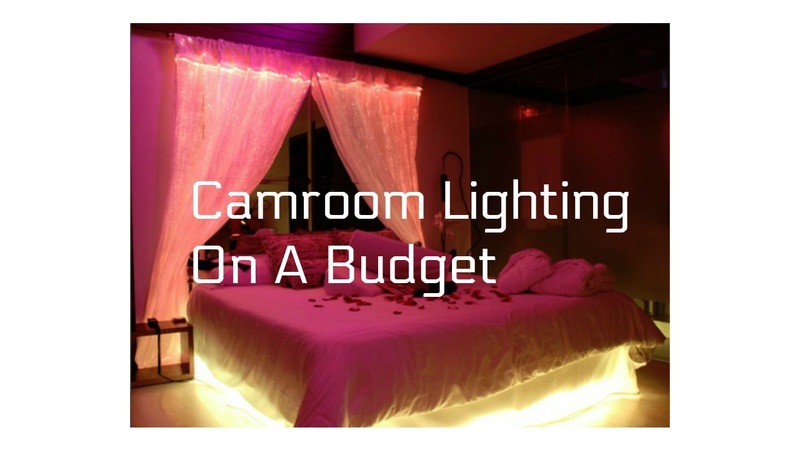 In keeping with the theme for lighting on a budget I would recommend using CFL bulbs (Compact Florescent Lamps). These are inexpensive and can elevate your stream while providing 4k lighting effects that can turn any camroom into a professional studio in no time. My preference for using CFL bulbs are in five arm floor lamps that can be easily adjusted to accommodate any three point lighting set up. With 4K now becoming the norm, anything which assists in the need for less colour correction and balance in post production is welcome. 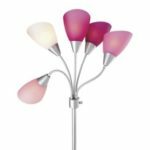 Floor Lamps With Pink Shades Are Perfect For Those With Red Undertones In Their Skin. Try A Lamp With Blue Shades If You Have Cool Undertones. These bulbs are the best versatile lights and are indeed fit for purpose giving off a true daylight balance and brightness suited for shooting creative content. And if you decide to use CFL bulbs in a floor lamp such as the one mentioned above you can play around with the amount of light utilized because most floor lamps of this type come with a dimmer or the ability to control the amount of light shown. I would recommend this set up if you are unable to live stream or film clips in natural sunlight.